I would like to welcome coach Burgess to Region 4!! Hope he is ready for some Walt's Wings!! 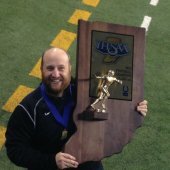 They called me 3 weeks ago: I knew this was coming when we were talking and I advised my guy on the other end that they will come off greedy and told him that we will have sent Hudl over 20k thus far since 2011 and you want to now charge for storing our own games, many times being used for future teaching tools. So Gross I am really looking forward to hearing more about the VAR system: Dropboxing games, Terrabytes. etc.